The DS160 quality of light is exceptional due to a round flash tube and custom powder coated reflector designed specifically to deliver the softest, most even coverage possible. State of the art Li-ion battery technology produces over 450 full power flashes at an unprecedented 1.4 second recycle time. Ikelite's proprietary quick-release toggle system attaches the battery pack with ease and confidence, making a flooded battery virtually impossible. Both Ikelite's DS160 and DS161 strobes are legendary for their ability to keep up in rapid firing situationsa cut above any flash on the market. Electrical sync connection and a high-capacity battery pack provide the speed you need to capture fast moving subjects like sharks and sailfish at just the right millisecond. State of the art Li-ion battery technology produces over 450 full power flashes at an unprecedented 1.4 second recycle time. Ikelite's proprietary quick-release toggle system attaches the battery pack with ease and confidence, making a flooded battery virtually impossible. The size of the DS161 is uniquely balanced to its weight to provide near neutral buoyancy in salt water, providing the most comfortable handling on the market and reducing arm fatigue. Ikelite's second generation of the Li-ion battery pack and charging system features the latest in cell conditioning technology to keep you on the go and improve the lifetime of the battery. 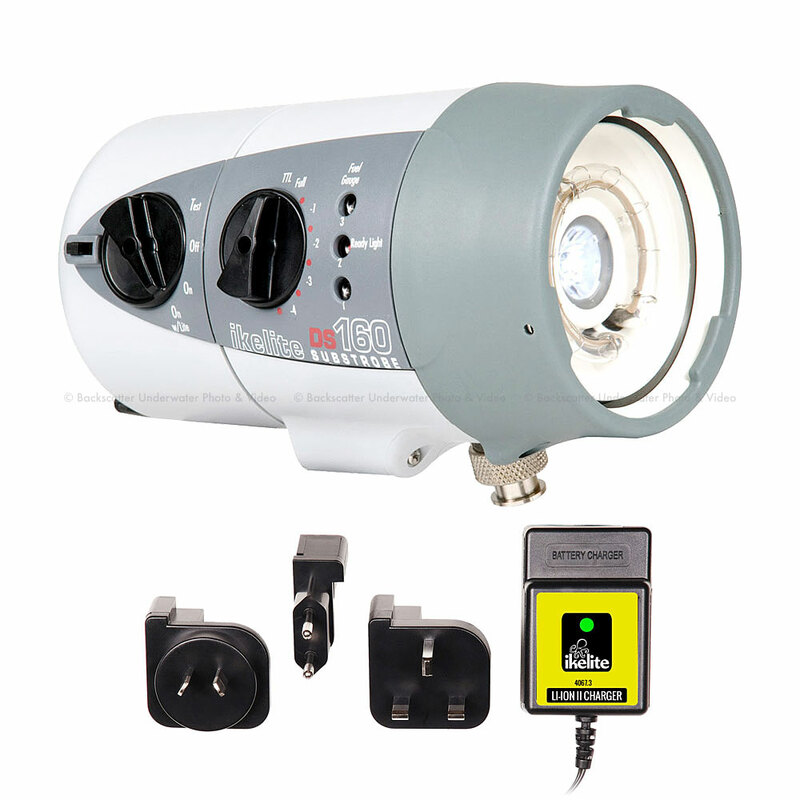 The DS160 Strobe is also available with an optional NiMH battery pack. See Similar Items below. The included Smart Charger for Li-Ion (2nd Gen) accepts variable voltage in the 100-240V range and includes AC adapters for US, Europe, UK and Australia. This charger is compatible with lithium ion battery packs only. The rechargeable battery pack is interchangeable for quick turnaround in between dives.